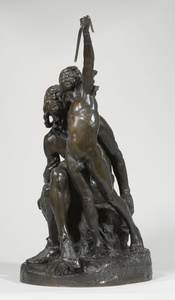 Hermon Atkins MacNeil (February 27, 1866 – October 2, 1947) was an American sculptor born in Everett, Massachusetts. He is known for designing the Standing Liberty quarter, and for sculpting Justice, the Guardian of Liberty on the east pediment of the United States Supreme Court building. He also made Justice, the Guardian of Liberty on the east pediment of the United States Supreme Court building. MacNeil was one of a dozen sculptors invited to compete in the Pioneer Woman statue competition in 1927, which he failed to win. One of his last works was the Pony Express statue dedicated in 1940 in St. Joseph, Missouri.